Yes, I was away. I went to Chicago for a long Labor Day weekend to cover a jazz festival and drink lots of beer; I also introduced my family to two wonderful goat’s milk cheeses, Kunik and Pantaleo. Upon my return to Westside Market East Village, the beer and cheese pairings felt kinda similar to what I had been doing before I left, then last Sunday, my cheese department colleague, took on a new tack. Rather than give me one piece each of three different cheeses to work with, he gave me three pieces of the same cheese. That created a new range of possibilities and focused the narrative somewhat. On Sunday, he gave me three pieces of an Italian Asiago Fresco. Most Americans know Asiago as a aged cheese that’s a little more blunt and less sweet than Parmigiano Reggiano, a good cheese to grate into a mac and cheese with some mozzarella and fresh tomatoes. Asiago Fresco is different; it has a supple, creamy texture and lots of herbal notes ranging from basil to anise. I knew that I would need to explain the cheese to a lot of the clientele so I paired it with beers that were easily discussed. I went with India Pale Ales, hoping that the texture of the cheese would pair well with the florals overtones and resinous finish of the beer. It worked for Cambridge’s The Audacity of Hops and Singlecutt’s Does Anyone Remember Laughter. Both pairings resulted in memorable comments from the clientele. NYU is back in session, so I’m cautious about sampling to anyone I think is under 23. But two of the people I judged to be just legal enough not to card, had amazing beer bonafides. One was a young man who is not only a homebrewer but has begun to grow hops on the roof of his apartment building. The other was a young German woman. After she and her boyfriend tried the Singlecutt, thrilled at sampling some NYC brewed beer, they began examining the Becks/St. Pauli Girl section of the case. I pointed them to the single bottles where we have Weihanstephaner, Schneider-Weisse and Mahr’s. When she saw the Mahr’s, she smiled broadly and told me she had interned there. She was the assistant brewmaster for a new brewery in Germany. That was a cool way to end the day. Monday’s cheese was the Ford Farm Traditional English Cheddar, another cheese with significant talking points as it’s much more complex, grassy and earthy than conventional North American cheddars. 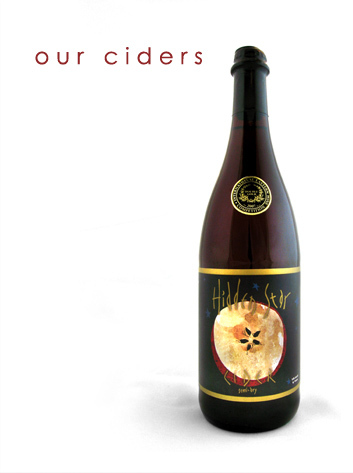 I paired it with the Slyboro Hidden Star cider, a classic pairing that always goes over well. I don’t remember Wednesday’s cheese but the beer itself was remarkable. It was the Stone Stochasticity Project Hi-Fi/Lo-Fi Mixtape, a beer from the Southern California based brewery that blends barrel aged ale with newly brewed ale. The result is a beer that has some of the bright hoppiness of a new ale and some of the depth, roundness and richness of a barrel aged beer. I assumed that they are using new American oak since the bottle offers no other information on the barrel. Anyway, that’s a mouthful and a half, and I’d avoided sampling the beer because of that. The store manager, my partner in crime on the beer program, asked me to sample it. Voluminous talking points or no, the beer is tasty and boom! 90 minutes of sampling moved ten 22oz bottles of the stuff. I was also asked to sample the Stone Farking Wheaton Woot Stout, a collaborative beer that checks in at 13% ABV. It has very rich dark chocolaty overtones and it paired wonderfully with the nutty, grassy Schweizer Berggunuss from Caroline Hostetler. I was initially wary of sampling a high ABV stout on a warm Friday afternoon, but it worked out great. It’s a beer savvy neighborhood. No sense in underestimating the clientele. This entry was posted in beer, cheese, culinary, food, foodie, whiskey, wine and tagged alpine cheese, beer, cheddar, cheese, cider, dry cider, india pale ale. Bookmark the permalink. mmmm cider and cheese. I haven’t had a chance to try Slyboro cider yet, but finally found some (its tough in WA, although we have a huge selection here) and have a bottle at home to try. Thanks for sharing!